The Captain America franchise is the only franchise within the Marvel Cinematic Universe (MCU) which gets better and better with each film. Captain America: The First Avenger offered a change of tone with its period setting and for that, it stands out among ‘Phase One’ of the MCU. Naturally, the sequel, Captain America: The Winter Soldier, also offered a change of tone. Directing duo, Anthony and Joe Russo, created a film that is less of a comic book film and more of an espionage thriller film. It focuses on addressing real-world issues to craft a narrative that audiences can appreciate. After rewatching The Winter Soldier, and their work on the threequel, Captain America: Civil War, it’s not surprising that the brothers were hired to direct the highly anticipated, Avengers: Infinity War, and its untitled sequel. Captain America: The Winter Soldier continues the story of Steve Rogers (Chris Evans), who discovers a conspiracy that threatens the world. 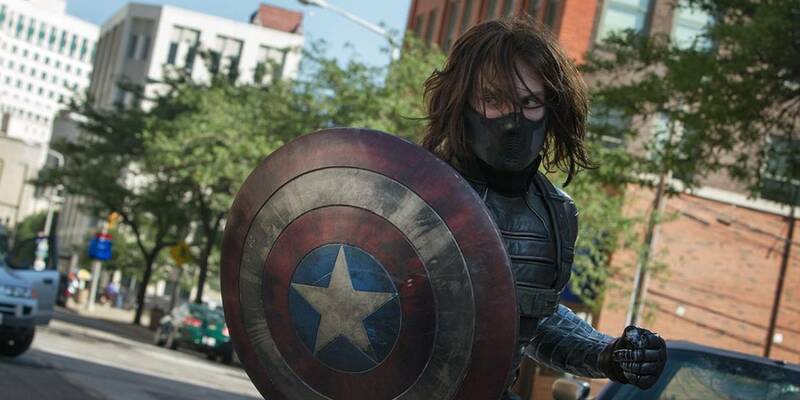 At the centre of the conspiracy is a mythical assassin known as The Winter Soldier. The Captain America films have always been the “serious” MCU films. The Winter Soldier is a perfect example of how to create a comic book film that has a thoughtful message in its narrative alongside genuinely intelligent humour. This should come as no surprise to anyone who has seen Arrested Development or Community, two comedy shows that the brothers both worked on. The action is exhilarating with the Russo brothers proving that, despite their extensive background in comedy, they know how to craft fantastic action set pieces. The action feels more like something you would see in a spy film, with its gritty and often brutal nature. The opening scene sets the standard that the rest of the action, not only in The Winter Soldier but any action sequences in any film featuring Cap. Watching Cap and Black Widow (Scarlett Johansson) take on an entire ship of terrorists remains one of the standout action sequences within the MCU. Just like The First Avenger, the performances in The Winter Soldier are all exceptional. There really isn’t a poor performance in the film. Chris Evans asserts himself as a true action star whilst Scarlett Johanson further continues to prove herself as capable (probably more than her male co-stars) of performing in the action-heavy scenes. It’s hard to highlight the standout performers as everyone is at the top of their game in The Winter Soldier. However, Robert Redford does deserve a special mention for his performance as the villain, Alexander Pierce. He took on the role as he wanted to experience the process of making a contemporary Hollywood blockbuster, and he fully gives himself over to the process, delivering a thoroughly compelling, though underwritten, villain. Although The Winter Soldier is filled with awe-inspiring action sequences, it doesn’t forget the most important part of any film: its characters. The relationship between Cap and Black Widow is both fun and hilarious. A romance between the pair is initially implied, however, by the end of the film, it is made very clear that their friendship is, thankfully, completely platonic (making their relationship romantic would have been a disservice to both characters). Also, the revelation that The Winter Soldier is Cap’s believed-to-be-dead friend Bucky Barnes (Sebastian Stan) is brilliant as the relationship between the pair is not only the real heart of The Winter Soldier but the entire Captain America trilogy. Another standout addition to the MCU is Anthony Mackie who makes his introduction as Sam Wilson/Falcon. He delivers a charismatic performance as you’d expect from him and is now one of the most exciting prospects within the MCU. That being said, the film does follow the typical Marvel formula and as a result of this, it is often predictable. This is especially true during the third act which ends up being nothing more than the typical GCI explosions seen in almost every comic book film ever. The twists involving Black Widow disguising herself as a member of the World Security Council is not surprising in the least. Furthermore, the major twist involving Nick Fury’s “death” is frustrating as it further emphasises The Winter Soldier‘s conformation to the MCU formula. Fake deaths are something that the MCU has been extremely guilty of, with major characters being resurrected numerous times, and not always in the films, as seen with Phil Coulson’s (Clark Cregg) resurrection on the TV series, Agents of S.H.I.E.L.D. These resurrections harm the film’s credibility as it often feels like there are no stakes for any characters that are in the least bit important. Lastly, the CGI is, like most MCU films, rather mixed. The major CGI creations like the ‘Helicarriers’ look great but the same cannot be said for the CGI explosions. It is so disappointing that these films, with their massive budgets, still suffer from distractingly poor CGI. However, it needs to be said that as the years go by, the quality of CGI is vastly improving for the MCU. In the end, Captain America: The Winter Soldier is one of the best films in the MCU. The Russo brothers prove themselves to be one of the most exciting filmmaking duos in the industry today and rewatching The Winter Soldier further increased my confidence that the pair can live up to the hype with Avengers: Infinity War.